How Far is Rajapushpa Atria? This project is located in a very majestic place like Kokapet, Hyderabad. 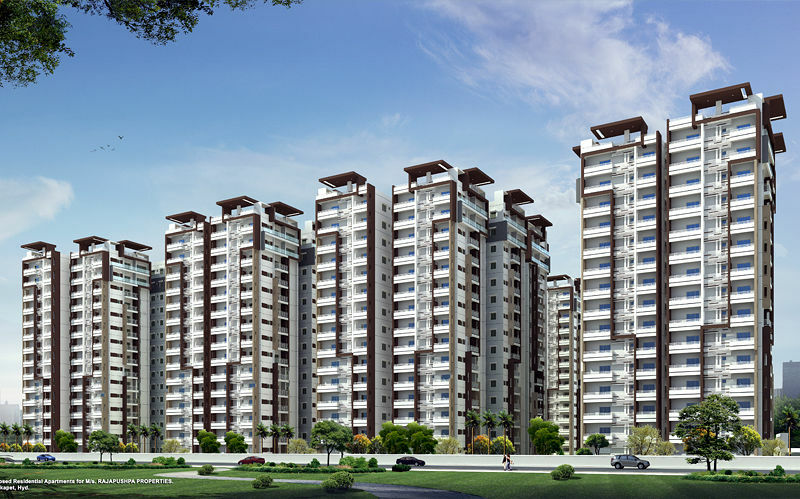 The project is a high - rise residential gated community, with meticulous apartments for sale in Hyderabad. Rajapushpa Properties is a very renowned name in the industry and this work of art; Rajapushpa Atria is a very well designed creation by the group. This development comprises of 10 towers of 15 storeys and it offers 2BHK compact and spacious apartments for sale in Kokapet, Hyderabad. It also offers 3BHK lavishly designed with all the modern amenities and 4BHK with added luxurious fittings for sale in Hyderabad. These apartments are tailored and thoughtfully crafted to suit every lifestyle and provide a hassle free life. This premium development is a combination of style quality and space. Rajapushpa Atria is located in a very strategic location, nearby is the thriving financial district of Gachibowli, being close to major priorities of life. If you are looking for a home in Kokapet, Hyderabad, this residential project is just the right option to choose from, it has one of the rarest amenities such as, landscape gardens, super bazar, sports facility, day care centre, car wash area, tuition room and many more such amenities that are very essential in modern day life. It is exactly what a homeseeker in this day would want to have, so be a part of Rajapushpa Atria and be a guest of luxurious and hassle free life. · R.C.C framed structure to withstand Wind and Seismic Loads. · Living & dining, master bedroom & home theatre room, all other bedrooms & kitchen, all balconies, bathrooms, corridors, staircase. · Premium quality ceramic wash basins of best brand. · Premium quality wall mounted EWC of best brand. · Premium quality concealed flush tank of best brand. · Premium quality Single Lever C.P fittings of best brand. · Concealed Copper Wiring of reputed make. · Power outlets for Air Conditioners in Living and Bedrooms. · Power plug for geysers in all bathrooms. · Power plug for cooking range, chimney, refrigerator, microwave ovens, mixer / grinders in kitchen, Washing machine / dish washer in Utility Area. · ‘3 Phase’ power supply in each unit. · Miniature Circuit breakers (MCB) for each distribution boards of reputed make. · Modular switches of reputed make. · points in Living Room and Master Bedroom. · Intercom facility to all the units connecting security and neighbourhood . Centralized Gas supply to all individual flats. Renowned and established in the realty field the builder has been successfully developing projects around Hyderabad locality. Rajapushpa takes pride in its path breaking trends adding new dimensions to urbane living. Rajapushpa Properties Private Ltd (RPPL) was established with a solemn objective of providing homes to the aspiring customers desirous of quality, timely delivery backed up by care and warmth. The Rajapushpa Regalia is an ongoing project by the builder and is expected to be delivered by 2020, located in Gachibowli. Since its inception, the company has been steadfast in its duty of giving value to the money invested by its customers. Residential or commercial project the company has repeatedly delivered a superior, world class quality. The driven, dedicated, hardworking, knowledgeable, skilled, creative and visionary management, employees, architects and engineers have worked untiringly to achieve this coveted success, name and fame. To create living spaces that incorporate innovative design with world-class construction. There-by, to redefine lifestyles. To create new benchmarks in realty development and project management services with a commitment to maintain the highest quality standards. To provide complete customer satisfaction through constant focus on quality and timely delivery within the stipulated timelines.